My next goal is to learn how to saw better. Plumb and square, ideally at the same time. 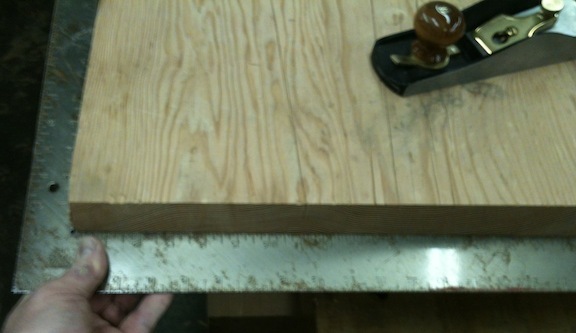 I just spent 45 minutes squaring the two ends of my bench that were cut less than perfect with my low angle jack plane. Less than less than perfect. I’d rather not do that next time. I used the toothed blade to rough in the ends and then finished with a regular blade. I checked square to the true face and the true edge, marking the high areas in red pen and planing those down. I worked it 99% of the way there with the toothed blade so I only needed to smooth things out using very light cuts with the regular blade. Working the ends when they are vertical (and having the weight of the plane working against you) is harder than when the surface being worked is horizontal. At the same time I can’t imagine standing it on end and working six feet up in the air to avoid that! I’m happy with the results, although I expect to smooth everything again after I fit the legs and do the final assembly. I’m heading back out to plane the other long edge (the one I had to rip to get to the width I wanted), then the last face. The legs need a few more weeks to dry out, so I have time to make some practice tenons on the offcuts. 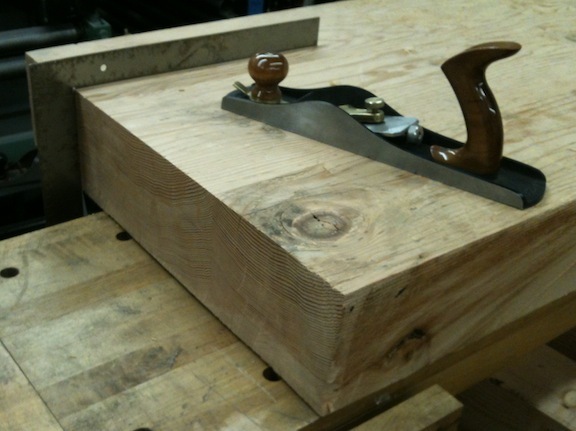 I also ordered a wooden vise screw from Lake Erie Toolworks, which will take about a month to get here. Maybe I’ll have time to start another project in the middle of finishing this one…great.